[TheExpress] Il ghiaccio dall'aspetto verde luminoso copre già circa 650 miglia quadrate (circa 1000 chilometri quadrati) - e sta crescendo di giorno in giorno. Gli scienziati della NASA che hanno individuato il ghiaccio verde tra le migliaia di immagini di routine indagando su 700 miglia fino al satellite Landsat degli Stati Uniti 8 immagini sono sconcertanti. La causa alieni fa presa su molti forum teoria della cospirazione on-line. Ma naturalmente i cervelloni della NASA hanno offerto alternative più credibili. I migliori scienziati fanno riferimento alla teoria del clima che ha creato il bizzarro ghiaccio verdastro che è probabilmente dovuto ad una massiccia fioritura di fitoplancton. Gli osservatori della NASA sono chiari, e dicono che la massa di fitoplancton e alghe è intrappolato nella morbido fango che forma il ghiaccio del mare o se si vive al di sotto del ghiaccio marino esistente dando quell’effetto verdastro. La patch di 1000 chilometri quadrato di ghiaccio verde è stato visto sopra la fotosintetica del plancton chiamato fitoplancton e le alghe crescono tutto intorno in estate dell'Antartide da ottobre a febbraio. E 'autunno in Antartide, ma la proliferazione di alghe sono state avvistate in questo periodo dell'anno. Il glaciologo Marine Jan Lieser di Australia’s Antarctic Climate and Ecosystems Cooperative Research Center della NASA, nel 2012 insieme ad un gruppo aveva registrato una enorme fioritura a fine febbraio e inizio marzo. Play slideshow di Youtube, scienziato, sconcertato ha incolpato gli alieni per l'area di calce, e riferisce che la massa di alghe era 124 miglia (200 chilometri) di lunghezza e 62 miglia (100 km) di larghezza - ancora più grande rispetto alla fioritura corrente. E gli esperti prevedono che la nuova fioritura diventerà più grande prima che l’inverno artico brutale prende piede. Gli scienziati in una spedizione per osservare i vortici verdi hanno scoperto che la fioritura non era libera di fluttuare , il ghiaccio del mare verde, o il ghiaccio del mare di alghe cresce su di esso. Le immagini sono state scattate dall' agenzia spaziale operativa Terra Imager (OLI) sul loro satellite Landsat 8.
l satellite copre l'intero globo ogni 16 giorni. Il Operativo Terra Imager (OLI) on-board camera e il sensore a infrarossi termica (TIRS) sono così potenti in grado di ingrandimento di individui in mezzo alla folla a una partita di baseball. [ZurichTimes] Per una spiegazione di che questi due articoli significano e che cosa sta realmente accadendo in Antartide è che stiamo vivendo cambiamenti climatici globali come sta vivendo questo momento con gravi anomalie climatiche in tutto il mondo. Inoltre, secondo alcune fonti Terra è infatti riscaldamento dall'interno e soprattutto nella zona dell'Antartide e in particolare sulla costa orientale dell'Antartide. Clif Alta recentemente parlato su questo fenomeno di riscaldamento fino alias Terra fase di espansione e altri siti hanno confermato questa informazione come bene. Antartide si sta riscaldando ora davanti ai nostri occhi e ciò che troveremo lì cambierà per sempre l'umanità. [TheExpress] The luminous-looking green ice already covers about 650 square miles (about 1000 square kilometres) – and it is growing by the day. NASA scientists who spotted the bizarre green ice among the thousands of routine survey pictures taken from 700 miles up US satellite Landsat 8 by are baffled. As ever aliens have been blamed by online conspiracy theory forums. But of course NASA boffins have offered more credible alternatives. 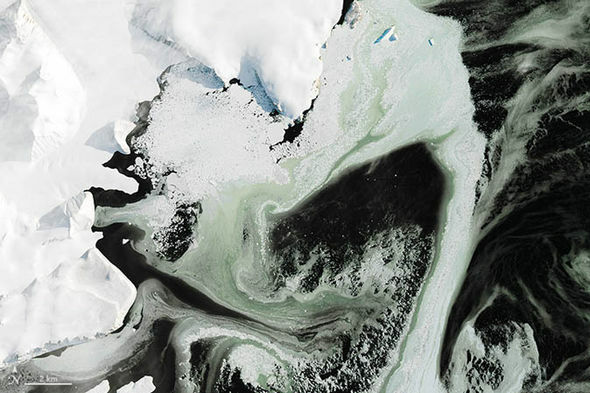 The best theory climate scientists have come up with is that the freakish green-tinged ice is probably due to a massive bloom of phytoplankton. 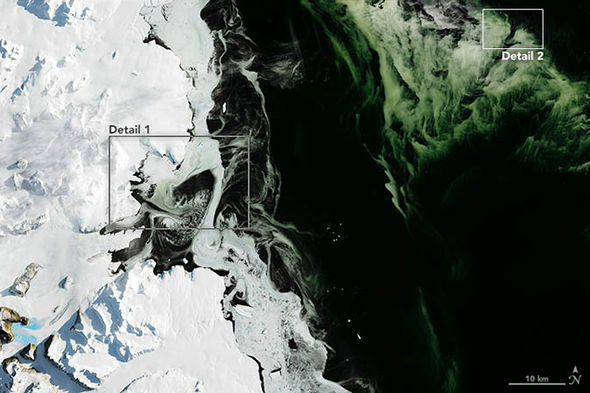 NASA observers are unclear if the mass of phytoplankton and algae is trapped in the soft slushy forming sea ice or whether it is living below existing sea ice. It is autumn in Antarctica but algae blooms can have been spotted at this time of year. Marine glaciologist Jan Lieser of Australia's Antarctic Climate and Ecosystems Cooperative Research Center reported to NASA's Earth Observatory that in 2012 a team had recorded an enormous bloom in late February and early March. Do you know what this 2.5mile long object moving under the Pacific Ocean could be? Play slideshow Youtube 1 of 7 NASA With scientist baffled online theorists are blaming aliens for the lime area That mass of algae was 124 miles (200 kilometers) long and 62 miles (100 km) wide – even bigger than the current bloom. And experts predict the new bloom will get bigger before the brutal Arctic winter takes hold. Scientists on an expedition to observe the green swirls found that the bloom was not free-floating algae, but green sea ice, or sea ice with algae growing on it. The pictures were snapped by the space agency's Operational Land Imager (OLI) on their Landsat 8 satellite. 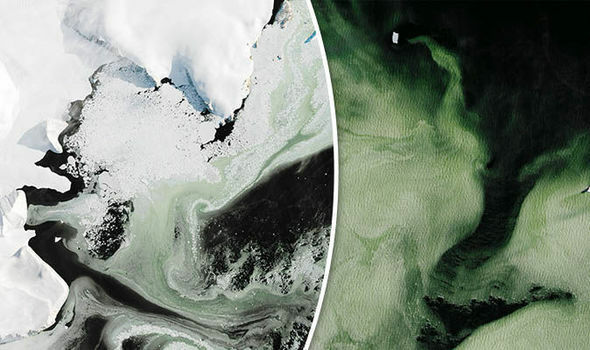 Climate experts have suggested the discolouration is simple down to a phytoplankton bloom Landsat 8, which was launched in February 2013 from Vandenberg Air Force Base, California, is part of the US Geological Survey which maps the world's landmasses. It orbits the globe at an altitude of 438 miles (705 km) and takes more than 700 pictures a day. The satellite covers the entire globe every 16 days. The on-board Operational Land Imager (OLI) camera and the Thermal Infrared Sensor (TIRS) are so powerful capable of zooming in on individuals in the crowd at a baseball game. [ZurichTimes] For an explanation of that these two articles mean and what is really going on in Antarctica is that we are experiencing global climate changes as being experienced right now with severe weather anomalies around the world. In addition, according to some sources the Earth is in fact heating up from the inside out and especially in the area of Antarctica and in particular on the the East Coast of Antarctica. Clif High recently spoke about this heating up phenomena aka Earth Expansion Phase and other sites have confirmed this information as well. Antarctica is heating up now before our eyes and what we will find there will forever change Humanity. Sapete che cosa potrebbe essere questo oggetto lungo 2,5 miglia in movimento sotto l'Oceano Pacifico?